The best place in the northeast for seafood is New England, right? They even named a chowder in honor of its seafood niche. But who needs New England when Hudson has its own bustling seafood restaurant on First Street in downtown Jersey City: JUST Beclaws, a 60-seat Vietnamese Cajun seafood eatery has been open a little more than a year and already it’s the go-to destination for foodies who like their shellfish fresh and cooked to perfection. three siblings and owners of JUST Beclaws. What also makes the restaurant special are its three owners, siblings, Francis Tran, 32, Nambinh Tran, 27, and Aivy Tran, 34. 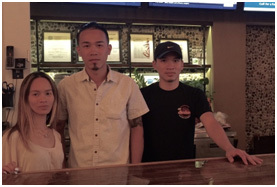 The three grew up in Jersey City learning the restaurant business from their parents who owned Miss Saigon, a Vietnamese restaurant right up the street on Newark Ave. 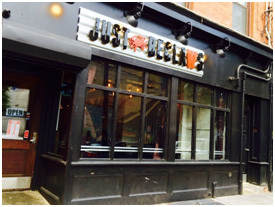 Seafood – mainly Shellfish — is the star of the show at JUST Beclaws. One side of the menu is devoted to Appetizers, Sandwiches, Sides, and Dessert; the other side is a list of shellfish served by the pound, seasoned with a choice of seasonings and hot sauce if you like. The choices are Shrimp ($13), Clams ($13), and Mussels ($12); Crawfish, Lobster, Blue Crab, Snow Crab, King Crab, and Dungeness crab, which are priced at market rate. Choice of seasonings include Garlic Butter, O’bay, Cajun, Lemon Pepper and O’bay with Garlic Butter. The restaurant gets very busy especially on weekend nights, Francis says. How do three siblings run a restaurant? Francis describes himself as the maintenance man (he left a 9-year apprenticeship as an electrician to build and run the restaurant) Aivy manages business affairs and handles the bookkeeping; and Nambinh keeps his sights on what goes on in the kitchen. All three know how to cook the menu; and can jump in at a moment’s notice.